Even the labels on the artworks have been reconsidered, delivering more information in a small space. 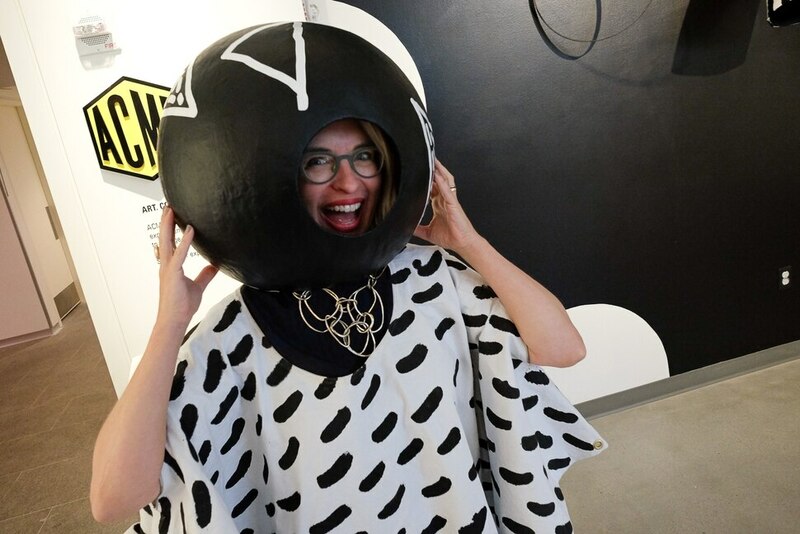 (Francisco Kjolseth | The Salt Lake Tribune) Gretchen Dietrich, executive director of the Utah Museum of Fine Arts, geeks out with interactive art in museum's new ACME Lab. The community space is designed for creative experimentation where visitors are encouraged to engage with art in fun new ways. UMFA reopens to the public on Saturday, Aug. 26, for a two-day celebration featuring new exhibits, tours, talks, yoga, a dance party and more with free admission. (Francisco Kjolseth | The Salt Lake Tribune) Gretchen Dietrich, right, executive director of the Utah Museum of Fine Arts, gives a media tour Friday, Aug. 25. The museum, after 19 months of being closed for building renovations and a reimagining of the gallery spaces, re-opens this weekend with a two-day celebration. (Francisco Kjolseth | The Salt Lake Tribune) The Utah Museum of Fine Arts officially reopens with a media unveiling Friday after 19 months of being closed for building renovations, and a reimagining of the gallery spaces. (Francisco Kjolseth | The Salt Lake Tribune) Shiva as Lord of Dance (Nataraja) from the Chola Dynasty ca. 12th-13th century is on display as the Utah Museum of Fine Arts officially reopens with a media unveiling Friday after 19 months of being closed for building renovations and a reimagining of the gallery spaces. (Francisco Kjolseth | The Salt Lake Tribune) Gretchen Dietrich, right, executive director of the Utah Museum of Fine Arts, gives a media tour after 19 months of being closed for building renovations and a reimagining of the gallery spaces. The UMFA reopens to the public on Saturday, Aug. 26, for a two-day celebration. (Francisco Kjolseth | The Salt Lake Tribune) Gretchen Dietrich, executive director of the Utah Museum of Fine Arts, gives a media tour Friday. (Francisco Kjolseth | The Salt Lake Tribune) A bronze sculpture by Paul Manship entitled The Moods of Time: Morning, 1938, welcomes visitors to the Utah Museum of Fine Arts as it officially reopens with a media unveiling Friday after 19 months of being closed for building renovations and a reimagining of the gallery spaces. (Francisco Kjolseth | The Salt Lake Tribune) Discarded Memories, 2008, by American born artist Chakaia Booker is on display as the Utah Museum of Fine Arts officially reopens with a media unveiling Friday after 19 months of being closed for building renovations and a reimagining of the gallery spaces. (Francisco Kjolseth | The Salt Lake Tribune) The Utah Museum of Fine Arts officially reopens with a media unveiling Friday after 19 months of being closed for building renovations and a reimagining of the gallery spaces. Signage will not only include more detail about a piece, such as Faith Ringgold's bold feminist perspective, but also will be in Spanish in some of the galleries. (Francisco Kjolseth | The Salt Lake Tribune) The remodeled Great Hall at the Utah Museum of Fine Arts features a new installation by Brooklyn-based artist Spencer Finch, in which Pantone color samples capture the colors he encountered around the Great Salt Lake. (Francisco Kjolseth | The Salt Lake Tribune) Las Hermanas Iglesias and the ACME Lab team have some fun with the interactive ever-changing exhibition meant to be handled, moved, worn and played with that is the first installment of the The Utah Museum of Fine Arts ACME Lab (Art, Community, Museum, Education). The community space is designed for creative experimentation where visitors are encouraged to engage with art in fun new ways. (Francisco Kjolseth | The Salt Lake Tribune) Artist Lisa Iglesias, right, outfits Gretchen Dietrich, executive director of the Utah Museum of Fine Arts, with interactive art in the ACME Lab. The museum's new community space is designed for creative experimentation where visitors are encouraged to engage with art in fun new ways. (Francisco Kjolseth | The Salt Lake Tribune) Artists Lisa Iglesias, left, and her twin sister Janelle, known as Las Hermanas Iglesias, play around in UMFA's new ACME Lab among the interactive art they've created. (Francisco Kjolseth | The Salt Lake Tribune) Gretchen Dietrich, executive director of the Utah Museum of Fine Arts, geeks out with interactive art in the museum's new ACME Lab. The community space is designed for creative experimentation where visitors are encouraged to engage with art in fun new ways. UMFA reopens to the public on Saturday, Aug. 26, for a two-day celebration featuring new exhibits, tours, talks, art making, yoga, a dance party and more with free admission. (Francisco Kjolseth | The Salt Lake Tribune) A visitor tours the photography works of Ilse Bing at the Utah Museum of Fine Arts, which officially reopens this weekend after 19 months of being closed for building renovations and a reimagining of the gallery spaces. 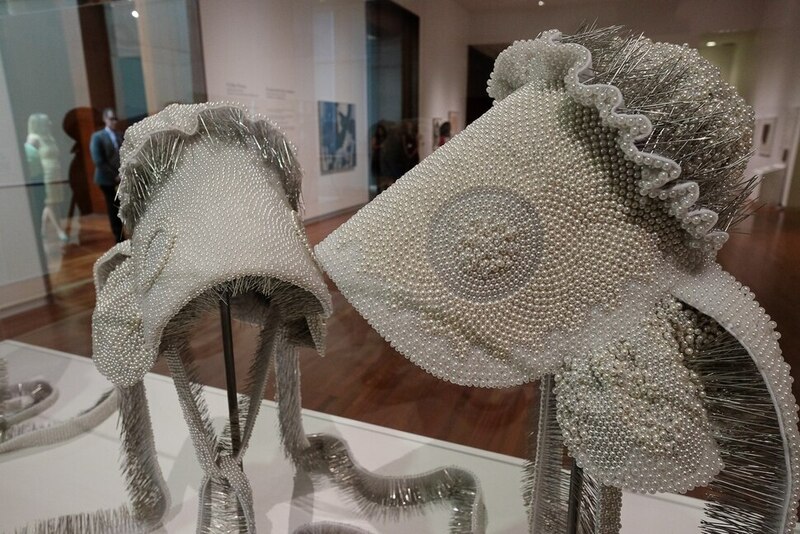 Utah art lovers will get their first chance in 19 months to walk the galleries of the Utah Museum of Fine Arts this weekend, and the museum staff is throwing a big party to welcome everyone back. A slate of events — including a Saturday night dance party, Sunday morning yoga, live performances, movie screenings, guided tours, outdoor ping-pong and a piñata bash — will mark the museum’s reopening, in which curators will show the community how the galleries have been reconfigured. At a media tour Friday morning, Gretchen Dietrich, the museum’s executive director, stressed how UMFA serves many communities — as the state’s main art repository, the biggest art museum in Salt Lake City and an educational resource for the University of Utah. “We really do try to be a lot of things to a lot of different kinds of people,” Dietrich said. One of the biggest ways the reimagined museum targets the community is also one of the smallest: the labels that identify the artworks. While UMFA was closed for renovations, to upgrade the “vapor barrier” that keeps the building’s humidity levels at museum standards, museum staff spent months thinking about the labels. (Francisco Kjolseth | The Salt Lake Tribune) The Utah Museum of Fine Arts officially reopens with a media unveiling after 19 months' of being closed for building renovations, and a "reimagining" of the gallery spaces. 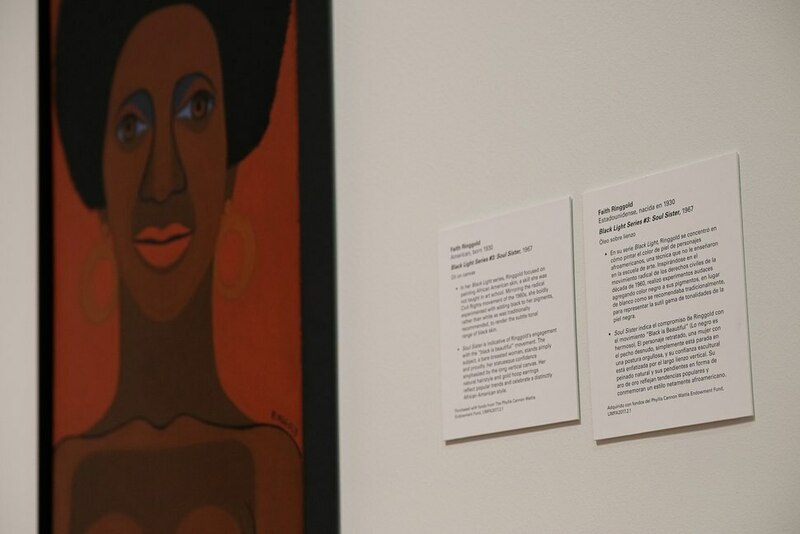 Signage will not only include more detail about a piece such as Faith Ringgold's bold feminist perspective but also be in Spanish in some of the galleries. Each label, Tassie said, required a lot of writing and rewriting, with curators and education staff going back and forth to strike the right balance between information and readability. The museum, Dietrich said, also sought opinions from the public about how much information to deliver. Traditionally, a label will list the artist’s name, the title of the artwork, the materials used to make it, the year it was made and the name of the rich benefactor who donated or loaned it to the museum. The new labels at UMFA deliver something more. They contain text, usually about 100 words, with three bullet points of information that give some context to the art. The bullet points allow museumgoers to digest as much information as they like, Dietrich said. 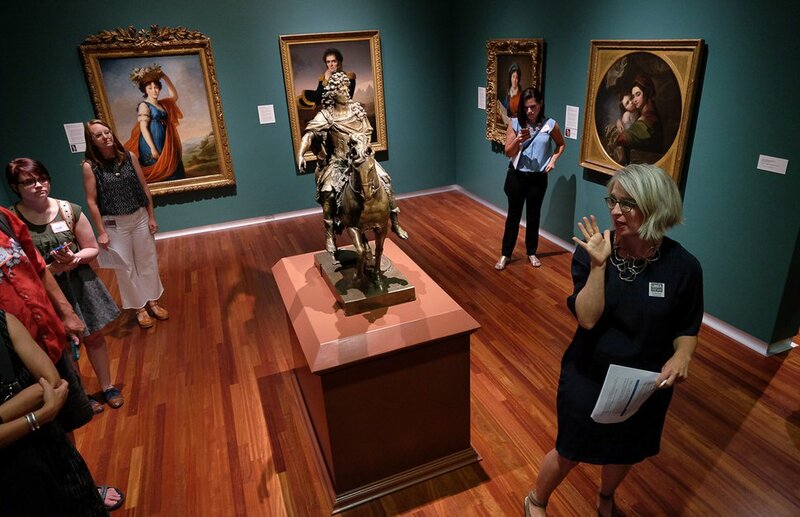 (Francisco Kjolseth | The Salt Lake Tribune) Gretchen Dietrich, right, executive director of the Utah Museum of Fine Arts, gives a media tour Friday, Aug. 25, as the museum reopens after a 19-month renovation and "re-imagining" project. For some works, words aren’t enough. One work in the European gallery is a portrait by the 18th-century American painter Benjamin West. The painting, of West’s wife and baby son, was done in the round-framed style of the Renaissance painter Raphael — so the label includes a tiny picture of a Raphael madonna to illustrate the similarities. In three galleries — Modern and Contemporary, American and regional, and Mesoamerican — the labels are presented in English and Spanish. Tassie said the museum is waiting to see the response to the bilingual labels before deciding whether to install them in other galleries. Visitors who want to learn more can check out the museum’s new conversation areas. In the Lookout site, just next to the Modern and Contemporary Gallery, tablets are loaded with articles about the artists in the gallery. The tablets also allow access to a database of the museum’s 20,000 objects. All this information is presented as unobtrusively as possible. “If we’ve done it well, it looks effortless,” Tassie said. The Utah Museum of Fine Arts will reopen, after being closed for 19 months, with a two-day public celebration Saturday and Sunday, Aug. 26 and 27. The museum will be open from 10 a.m. to midnight Saturday and from 10 a.m. to 5 p.m. Sunday. Here is a schedule of events for the weekend. Correction: Sunday, 2:37 p.m.: Admission is free at the Utah Museum of Fine Arts on the first Wednesday and third Saturday of the month. An earlier version of a box in this story included an incorrect day.